This male Southern elephant seal was tagged on the Edwards Islands as part of the iSTAR project. A telemetry tag designed by the Sea Mammal Research Unit is attached to fur on its head with epoxy glue. The tag, which sends back ocean temperature and salinity profiles via the Argos satellite system, is designed to fall off when the animal next sheds its fur at the annual molt. Photo by Mike Fedak, SMRU, University of St Andrews. A group of molting elephant seals is an assault to the nose. Just ask marine biologist Mike Fedak—he spent some time last February with the giant animals, whiffing their feces and hair as they sloughed their skin on the cold, windy beaches of the Edwards Islands, a mile from Antarctica. Fedak had ventured south as part of a research team that darted, measured, and secured seven of the seals with telemetry tags designed to collect a trove of environmental data as the animals foraged underwater. “Trying to pass a tape measure under a two-ton giant sausage is not entirely straightforward,” says Fedak, who’s based at the Sea Mammal Research Unit at the University of St. Andrews in Scotland. When tagged animals surface, the data they’ve collected are relayed to a global satellite system called Argos, decoded by computers, and disseminated to researchers—including biologists and oceanographers, as well as members of the meterological community. For instance, the Met Office—the U.K.’s national weather service—started using data from tagged seals last March to enhance its ocean condition forecasts, which inform the Royal Navy, the Air Force, shipping companies, and off-shore oil and gas companies. Certain seal species are particularly helpful for plumbing ocean data. Elephant seals, for example, spend more than 90 percent of their life underwater when they’re at sea (and not breeding or molting), according to Fedak, giving them ample time to collect environmental information. They also cover a lot of ground (or water, as it were): The species can reach depths of more than 2,000 meters, making them the deepest pinniped divers. 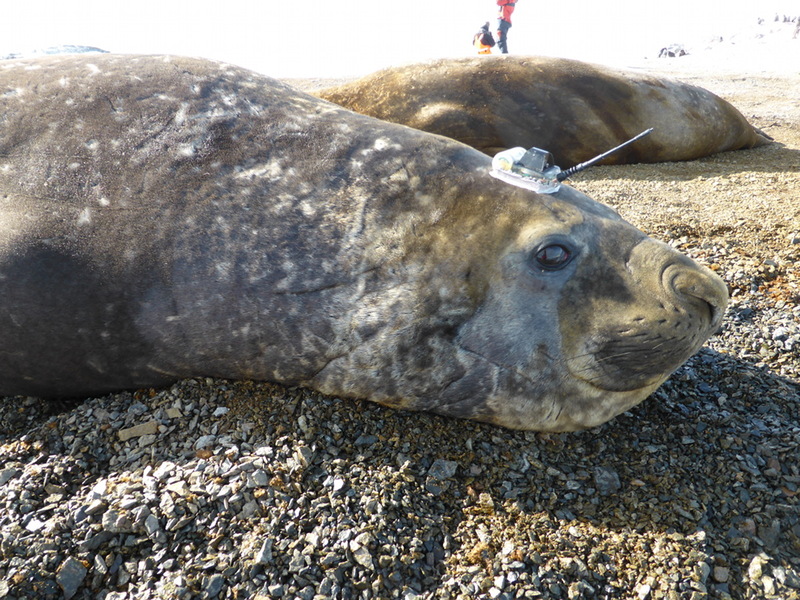 Fedak helped tag the elephant seals on the Edwards Islands, plus seven Weddell seals, as part of the iSTAR project, a multidisciplinary effort to understand ice loss in West Antarctica, and particularly at Pine Island Glacier, which flows into the Amundsen Sea. The glacier has been melting at an accelerating rate over the past 40 years and is the biggest contributor in Antarctica to global sea level rise, reports an article in Nature Climate Change. The specific causes and mechanisms underlying the ice loss, and the precise amount it might contribute to rising seas in years to come, are some of the greatest uncertainties surrounding the issue of climate change. After tagging the seals, “you suddenly see this explosion of data,” adds Karen Heywood, an environmental scientist at the University of East Anglia and a principal investigator for iSTAR. The last of the iSTAR seals’ tags stopped transmitting this past November. In total, the animals collected more than 12,000 CTD profiles, producing more data from the region than all the ships that have ever gone there, according to Heywood. In particular, the seals revealed a path towards the Pine Island ice shelf where warmer water courses, which drives glacier melting. Researchers with iSTAR will continue poring through the data for several years to come, according to Heywood. The information that the seals collected from the sea around various floating ice shelves is crucial to more accurately predicting whether glacial ice loss will continue accelerating, slow, or return to equilibrium—and how much it will contribute to sea level rise in the future. Heywood adds that the researchers hope to return to the Amundsen Sea in a few years to tag even more seals in an effort to explore the water around several ice shelves in the region that are thought to be melting just as fast as Pine Island. Mike Fedak never dreamed he’d help revolutionize ocean monitoring—the seals have brought him here. Now, he regularly meets with oceanographers to learn how to tailor the data to their needs, and the technology is improving rapidly. “The seals are doing a wonderful job,” he says. Chris Benjamin is a freelance journalist and author. He won the 2013 Dave Greber Freelance Book Award for his book, Indian School Road: Legacies of the Shubenacadie Residential School.